Debugging without debugger can sometimes be a pain. For instance host USB isn’t implemented by the TI-Nspire computer emulator nspire_emu, and troubleshooting my USB drivers on-calc is becoming impossible. I have decided to implement OCD, an on-calc debugger that mirrors most of nspire_emu debugger’s commands. I know calc84maniac started something similar a while ago, but unfortunately lost its source code. The debugger must be linked to the program to debug as a static library. The debugger console will show up when a breakpoint is hit. TI-Nspire developers, download it and help me improve it :) It hasn’t been extensively tested yet, please report any issue. It isn”t yet compatible with the CX because of nspireio on which it depends. 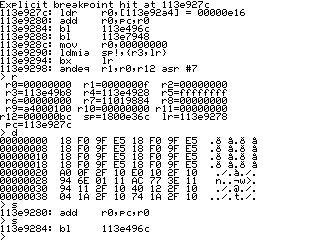 Many thanks to Goplat for some tricky code I have reused from nspire_emu such as the disassembler, and compu for the nice nspireio library I have slightly adapted for my needs. at the start of the breakpoint and restore it when the program continues. ExtendeD, your work is still amazing!